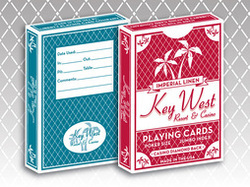 Above: Key West Resort & Casino playing cards: The unique card back design in two colors, casino ace of spades, and Liberty jumbo pips. 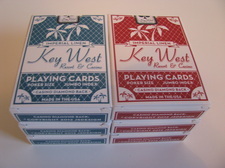 All decks are brand new, factory wrapped in cellophane inside the boxes, and sealed with a Key West deck seal. These are not used casino cards. 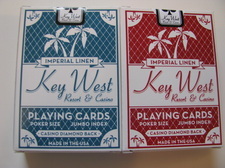 KEY WEST RESORT & CASINO PLAYING CARDS ARE BRAND NEW, NOT USED, CANCELLED CASINO DECKS. Shipping playing cards is always expensive. To get your cards to you in the most cost-effective way possible, we use U.S. Postal Service Priority Mail shipping boxes. They're fast, secure, and cost-effective. And while they have boxes that fit up to eight decks perfectly (small), sending 12 decks in a medium box adds to much to the shipping cost. So we don't sell 12-deck boxes any longer. These exceptional cut cards are the ultimate finishing touch to your table accessories. The sturdy plastic is strong enough to cut the deck, flexible enough to bend and flex, for easy dealing. After the deck is shuffled, cut the deck and place the new "bottom half" of the deck onto the cut card, so the bottom card can't be exposed during the deal. 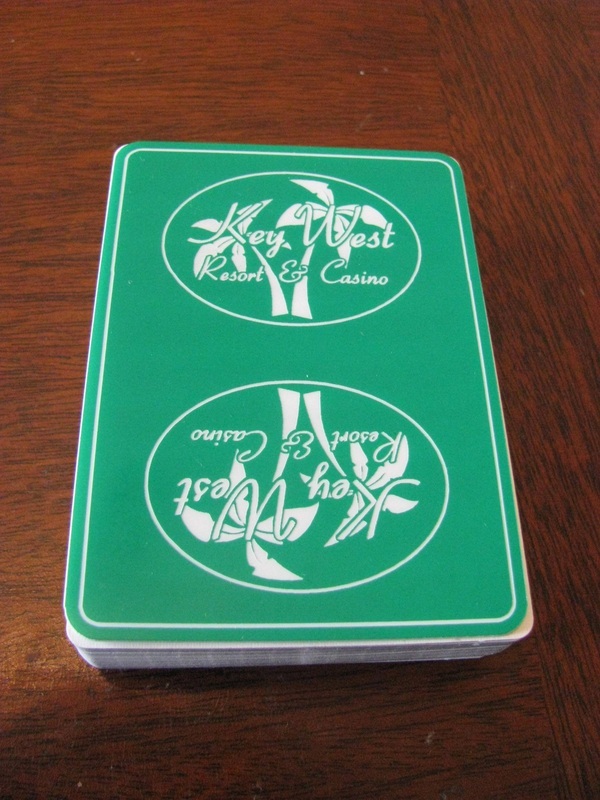 Our green card has a "Key West" color, with the logo embossed in white, end-on-end. The color was selected to make it easy to identify the cut card when you're collecting the cards for shuffling. 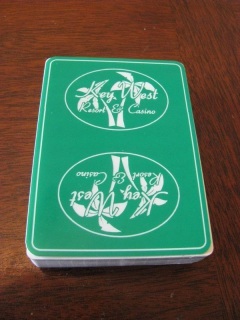 The cut card at left is shown atop a deck of Key West Resort & Casino playing cards, and fits perfectly. THIS ITEM IS NO LONGER AVAILABLE. 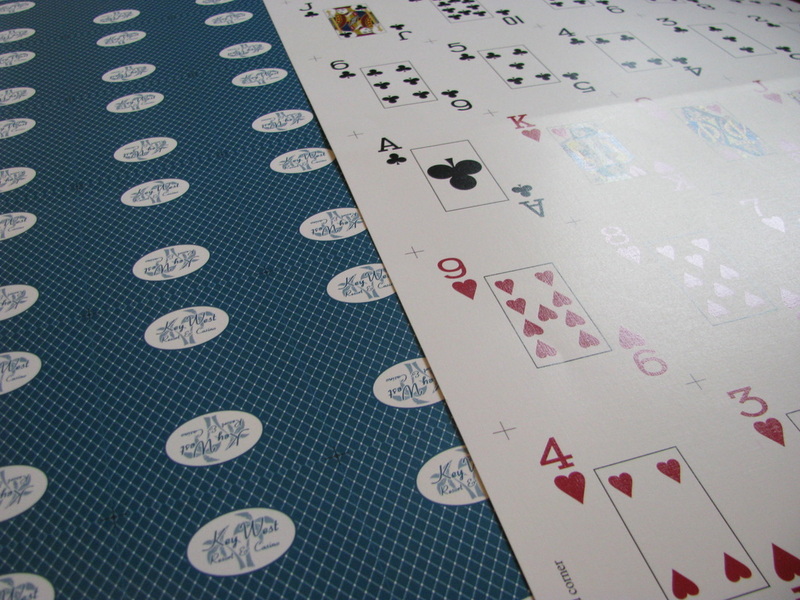 Prefer a more refined look to your card table? Our boxed two-deck setups are just the thing! Two decks of Key West Resort & Casino playing cards -- one red and one blue back -- cello wrapped in a divider, and boxed in a sturdy, dark blue two -deck gift box with the Key West seal on the front. Perfect for prizes or gifts at your next tournament or poker night. 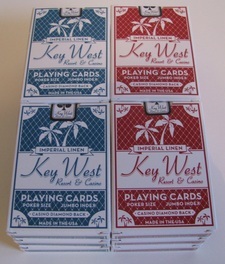 Uncut red Key West Resort & Casino decks. 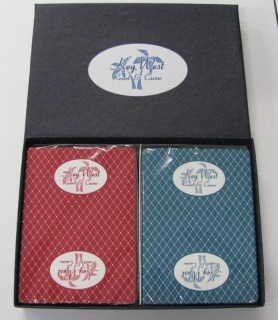 A rare collectors item, only 15 red decks were reserved as "uncut" during the press run of our Key West Resort & Casino cards. 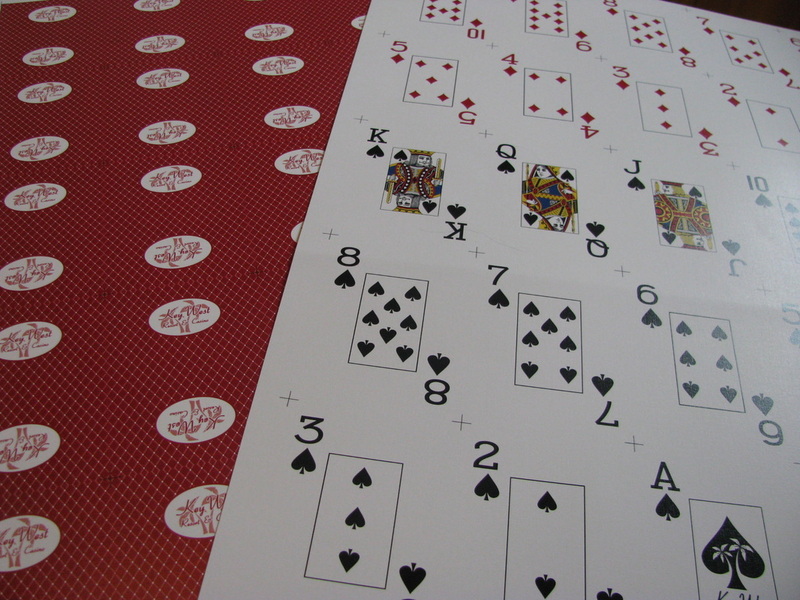 Each deck was created from two sheets of Imperial linen card stock containing 30 cards. Price: $12.95, plus shipping.